Friars Club? Delaney Club? Beverly Hills Tennis Club? Hillcrest Country Club? I don’t want to belong to any club that would have me as a member. The club is called: The Friars Club of Beverly Hills, The Delaney Club, The Lambs Club, The Beverly Hills Tennis Club, or The Hillcrest Country Club. What do you think? Quote Investigator: Evidence shows that Groucho Marx crafted a magnificently humorous line that has become a comedy classic. However, the same evidence does not reveal the exact wording of his comical gem or the precise circumstances of its employment. Yet, there is some agreement; for example, sources concur that Groucho was resigning from a club, and he was not refusing to join one. The following morning I sent the club a wire stating, PLEASE ACCEPT MY RESIGNATION. I DON’T WANT TO BELONG TO ANY CLUB THAT WILL ACCEPT ME AS A MEMBER. 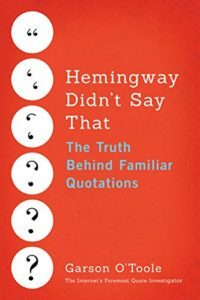 These four variants of the tale are the most salient in QI’s opinion, but several more are available. No one seems to know the exact wording of the resignation message which is endlessly mutable. The same joke appeared in “The Alden Times” of Iowa, 6 “The Manchester Courier” of England, 7 and other newspapers in the same year. When Walter Kiernan was inducted as President of Circus, Saints and Sinners (the lorgnette club in NY), he telegram’d the following message: “.. please accept my resignation. I do not care to belong to any organization that would have me as President!” Thass awright, Sam, but it’s the same witty wordage Groucho Marx wired to the sediddy Lambs club in ’48! Jessel has always been able to make Father laugh, and as a favor to him, he joined the Hollywood chapter of the Friars Club a couple of years ago. But Father doesn’t like club life, and, after a few months, he dropped out. The Friars were disappointed over losing him, and wanted to know why he was resigning. They weren’t satisfied with his original explanation — that he just didn’t have time to participate in the club’s activities. He must have another, more valid reason, they felt. I chose to ignore this remark and tried talking to him about Chaucer, Ruskin and Shakespeare, but he had switched to denouncing electric razors as a death blow to the tonsorial arts, so I dried up and resumed drinking. The following morning I sent the club a wire stating, PLEASE ACCEPT MY RESIGNATION. I DON’T WANT TO BELONG TO ANY CLUB THAT WILL ACCEPT ME AS A MEMBER. In conclusion, this is one of Groucho’s quintessential jokes. Yet, the specifics of the anecdote vary, and no one has presented physical evidence of the letter or telegram. QI suggests using the version of the line given by Groucho in his memoir, or the earliest 1949 version. Update History: On April 10, 2018 the 1891 citation was added. Also the bibliographical notes were switched to a numerical style. I once had a copy of Groucho’s letters, and that letter was included, with a date and the name of the addressee. Unfortunately, I no longer have the book, so I can’t give you the information. Yeah cheers Ralph. I used to work at the Friars Conutry Club and I actully read the letter and actioned it, but I didn’t photocopy it so you’ll just have to take my word as proof. Next Next post: Venice: Streets Full of Water. Advise.